This student-designed collapsible farm could help utilise the massive amounts of wasted space created by shipping containers. Millions of shipping containers traverse the world’s oceans each year. But a global trade imbalance, which sees China export more than double what it imports, means that most of these containers make their return trip empty. Design student Philippe Hohlfeld has conceived a novel idea to prevent this valuable space from going to waste. In his final year at London’s Royal College of Art (RCA), Hohlfeld had the idea to develop a collapsible hydroponic farm that could grow vegetables inside these vacant containers during their return journeys at sea. Called Grow Frames, they’re tackling the obscure challenge of utilising about 13 million shipping vessels worth of bare space. According to Hohlfeld, the plants would be grown in small, individual plastic bags containing all the nutrients and water needed for the trip. These are attached to the purposefully collapsible frames - able to fold to a fraction of the size so as not to take up space on its initial voyage in the container. 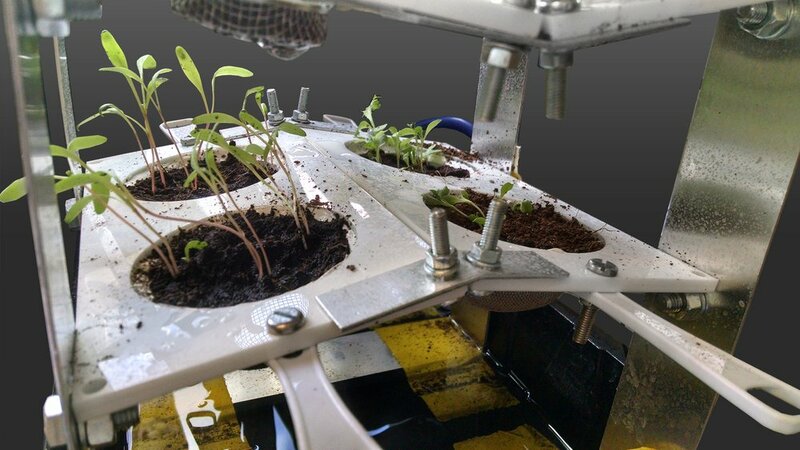 Each mini farm would use battery-powered LED lights to trigger photosynthesis. Adjustable to provide precisely the right amount of light for optimal growth, the lights and the battery would hold enough power for the duration of the voyage; ideal for an approximately three week journey from the UK to China. Though the farms contain seeds for cabbages, spinach, lettuce and bean sprouts, Hohlfeld knew the environment inside the containers might hinder their successful flowering - as plants of this nature grow best in balance with carbon dioxide producing animals. By introducing mushrooms to the mini farms - fungi which respire similarly to humans - he found a way to ensure the balance of oxygen and CO2 would remain optimum. Having presented his proof-of-concept design, the Design Engineering student now hopes to turn the Grow Frame into a working prototype to be tested in the opens seas. He is currently seeking investors to further develop his prototype. It is estimated that it will cost a total of £15,000 to develop, manufacture, and implement a shipping trial.